Blueprint’s SeaTrac series is a new range of versatile micro-USBL tracking and data modems for use in underwater applications. Built around a powerful broadband spread spectrum signalling scheme, these multi-purpose acoustic transponder beacons are capable of simultaneously tracking asset positions and undertaking bi-directional data exchange. When used in a tracking application, one X150 is mounted from the supervisor vessel, and connected to a PC running the SeaTrac NavPoint display and logging software. All positions are computed by the X150 beacon, so no additional PC hardware is required. Sub-surface assets to be tracked (including Divers, ROV’s, AUV’s etc) are fitted with an X010 or X110 beacon, and optionally may use the data port to provide periodic acoustic communications with other systems and sensors. In this mode, up to 14 other beacons may be tracked at ranges up to 1km from the supervisor, with the position of each being optionally broadcast to others in the network. 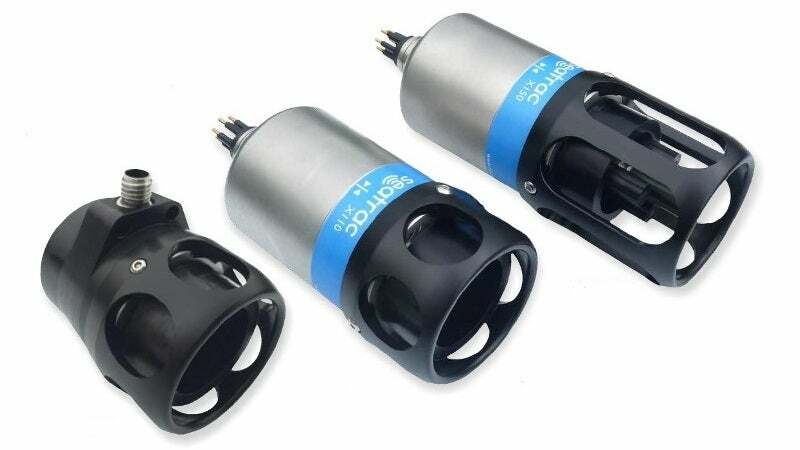 Use of the X150 USBL beacons will allow the interrogating end of the link to obtain a relative position of the remote modem during data exchange, while X010 and X110 beacons will provide distance between modems. Each beacon is fitted with a nine Degrees-of-Freedom (DoF) attitude and heading reference System, taking data from the on-board MEMS gyroscope, accelerometer and magnetometer to produce pitch, roll and yaw information that is made available to external applications via the communications port. NavPoint is a Windows software application that allows users to track up to 14 underwater assets, each fitted with a SeaTrac acoustic beacon, from a single USBL beacon. NavPoint has a variety of features to help users perform positioning, navigation and survey tasks, including the logging and playback of operational data, interfaces to satellite positioning systems, geographic markers, waypoint and destination navigation information and real-time data output to other NEMA compatible systems. An overview of Blueprint's SeaTrac range of tracking and data modems.